Cincinnati Financial (CINF) has increased its dividend for 56 consecutive years, an impressive streak that only seven other U.S. public companies can match. Perhaps more impressively, a shareholder who purchased one share of this well-run insurer before 1957 would own more than 2,146 shares today, assuming all shares from stock dividends and splits were held. Few companies have created this level of wealth for their shareholders over the decades, and you can see that Cincinnati Financial’s stock has significantly outpaced the S&P 500 over the last 30 years as well. Let’s take a closer look at this dividend king, which enjoys a large base of recurring revenue, generates excellent free cash flow, and has a bright long-term outlook, to see if it might be an appropriate stock for investors living off dividends in retirement. Cincinnati Financial was formed in 1950 and is among the top 25 U.S. property casualty insurers today, offering business, home, and auto insurance. Insurance companies make money by writing and selling insurance policies (which typically breaks even or loses money for most insurers), and investing policy proceeds for income until claims need to be paid out (this is where the money is really made). Local independent insurance agencies market Cincinnati Financial’s policies within their communities, which span across more than 40 states. The company’s mix by premiums written in 2016 was 64% commercial, 25% personal, 6% life, 4% excess & surplus and 1% other. By state, 15% of Cincinnati Financial’s premiums came from Ohio, 7% from Illinois, 6% from Indiana, 6% from Pennsylvania, 5% from North Carolina, 5% from Georgia, and 5% from Michigan. In other words, Cincinnati Financial is nicely diversified by insurance line, premium mix, and geography. Insurance companies live and die by managing risk. If insurers fail to price risk accordingly in their policies, they won’t be around for long. Compared to some insurers, Cincinnati Financial’s underwriting process is somewhat more aggressive because the company targets a combined ratio between 95% and 100%, which means that it expects its policies to be slightly profitable at best (when a combined ratio is below 100%, the company achieves an underwriting profit). The company ended full-year 2016 with a combined ratio of 94.8%, which is better than its target and the estimated property casualty industry aggregate of 100.7%, as per A.M. Best. As seen below, Cincinnati Financial’s combined ratio has outperformed the industry in the past five years. The company has also produced 28 years of favorable loss reserve developments, which means it has conservatively booked more losses than it has actually realized each year. This is yet another sign of management’s conservatism. Cincinnati Financial’s reinsurance program also limits its losses beyond certain thresholds in the event of catastrophes such as earthquakes, and its pristine balance sheet provides additional comfort. In addition to Cincinnati Financial’s proven risk management track record, the company has several other competitive advantages. First, its large size (Cincinnati Financial is one of the 25 biggest U.S. P&C insurers) provides economies of scale in marketing, administrative operations, and support staff. Cincinnati Financial is able to spread these costs over a sizable pool of insurance policies to keep its prices very competitive. Cincinnati Financial is also able to price its premiums lower than smaller competitors because its risk is reduced with a larger pool of policies. Furthermore, the company’s long operating history, range of insurance products, and size provide branding benefits and trust with the agencies that market Cincinnati Financial’s policies. Establishing and supporting relationships with agencies takes significant time and cost but provides Cincinnati Financial with relatively low-cost distribution advantages as it expands geographically. Cincinnati Financial has over 1,600 agency relationships in more than 2,100 locations across the country and does everything possible to support them. The company doesn’t compete with agencies by selling online or direct to consumers and instead employs more than 3,200 associates who provide support to field associates (there has also been a 24% increase in field staff since the end of 2011). As a result, Cincinnati Financial is the number one or number two carrier by premium volume in agencies partnering with it for five years or more, although an agency may represent dozens of carriers. In addition to effective distribution channels, the insurance market also requires strict compliance with regulations and substantial amounts of capital to compete. A large pool of policies and financial assets are needed for an insurer to be able to pay out claims and survive catastrophes, creating barriers to entry for new players. While catastrophic events can strike at any time, some states are more prone to them than others. For example, California and Florida are frequently hit by earthquakes, hurricanes, and other natural disasters. One of the things to like about Cincinnati Financial is that it has no presence in California and a minimal presence in Florida. Most of its operations are in the Midwest, perhaps reducing its exposure to catastrophes. Finally, the mature state of the P&C insurance market provides another advantage for Cincinnati Financial. When a market’s growth rate is low, new entrants have to steal market share from incumbents to gain a foothold. Cincinnati Financial’s policy renewal rate has been between 80% and 90% most years, providing a solid base of recurring revenue that helps it keep its policy prices competitive and market share stable. Insurance is also a product that is always in demand regardless of economic cycles, which has helped Cincinnati Financial generate consistent results over the course of many years. The insurance industry is known for going through pricing cycles, which significantly impact the profitability of practically all players. Insurance is essentially a commodity, so pricing follows supply and demand. Demand is generally stable given the non-discretionary nature of insurance, so supply is the main driver of these cycles. When insurers have a healthy pool of profits, strong capital reserves, and excess underwriting capacity, they are more apt to lower pricing to chase market share for growth. This environment typically results from several years of minimal natural disasters and catastrophes. 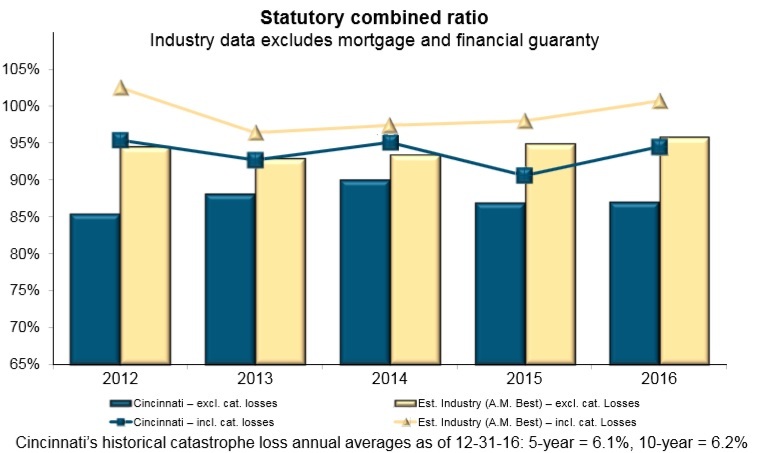 After a period of catastrophes and tighter capital conditions, there is less underwriting capacity in the market as insurers look to improve their financial condition. These periods are marked by better profitability and more rational pricing. Cincinnati Financial must put up with this cyclicality and remain disciplined with its pricing of risk and balance sheet strength, regardless of market conditions. Of course, unexpected catastrophes are arguably the biggest risk faced by insurers. A “perfect storm” can wipe out smaller, less disciplined players completely. As mentioned earlier, Cincinnati Financial is fairly well diversified with the states it does business in, avoids some of the riskier areas like California, and has a long operating history, which adds to the confidence investors can have in the firm’s conservative underwriting process. However, the company’s results were somewhat impacted by catastrophe losses in 2016. Three events that together added 7.5 points to Cincinnati Financial’s 2016 combined ratio were a hail storm in San Antonio, Hurricane Matthew, and the Gatlinburg wildfire. The company estimated $106 million in catastrophe losses during the first quarter of 2017, which caused its stock to drop. Underwriting aside, Cincinnati Financial does have more risk with its investment portfolio than many other insurers because it has around 34% of its portfolio in common stocks (most other insurers invest 10-20% of their portfolio in stocks). The portfolio is diversified (no stock is more than 3.7% of the portfolio) and invested in many quality dividend growth stocks, but these investments are still more volatile than a portfolio with a higher mix of investment-grade bonds. Finally, it’s worth noting that while the insurance industry is generally slow to change, it is changing. Technology is leading to more advanced data models that are pricing risk more efficiently on a policy-by-policy basis, which will only result in more competition for accounts with the best risk profiles. Moreover, easy availability of capital and increasing market competition may further exert pressure on policy pricing. Furthermore, Cincinnati Financial is completely dependent on independent agencies to sell its insurance policies. According to the Independent Insurance Agents and Brokers of America, independent agencies write about 60% of overall U.S. property casualty insurance premiums today. However, more policies will likely be purchased online over the coming decade. Selling policies online could actually result in lower prices and greater profits for insurers because they do not need to pay commissions and can save labor costs as well. Overall, Cincinnati Financial’s financial conservatism and long-standing customer and agency relationships help mitigate many of these concerns. Cincinnati Financial’s dividend appears to be safer than most company’s dividends with a Dividend Safety Score of 89. Over the last four quarters, Cincinnati Financial’s dividend has consumed 67% of its earnings and 42% of its free cash flow. These are reasonable payout ratios, but they are getting to be on the higher side of a comfortable level for a P&C insurer given the risk of unexpected catastrophe events hitting profits like they did in 2011 (see the spike below). However, one of the nice things about insurance is that it is always in demand regardless of economic conditions. 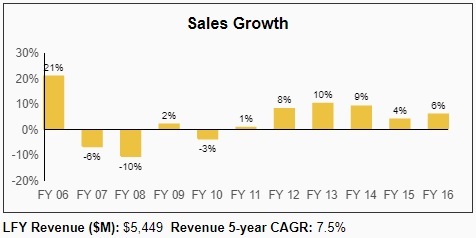 We can see that Cincinnati Financial’s sales fell by 10% during fiscal year 2008 but actually increased by 2% in 2009. The company’s stock also outperformed the S&P 500 by 14% in 2008, and management raised the dividend. Unfortunately, Cincinnati Financial’s investment portfolio (remember its above-average exposure to equities?) performed poorly during the financial crisis and the company was hit with underwriting losses that caused earnings per share and free cash flow per share to drop by 47% and 26%, respectively, in fiscal year 2008. While Cincinnati Financial’s sales don’t fluctuate too much, its profits are clearly impacted during recessions. Importantly, Cincinnati Financial’s business model generates solid free cash flow in almost any environment. Even during the depths of the financial crisis, Cincinnati Financial generated enough free cash flow per share ($2.74) to more than cover its current annual dividend payment ($1.92). However, the chart below also highlights the impact that record high catastrophe events can have on the business (see fiscal year 2011). While the insurance industry has numerous attractive characteristics, it is still a commodity product. As seen below, Cincinnati Financial’s return on invested capital has remained positive but under 10% since fiscal year 2008. While the company is still creating value for shareholders, its return on capital will always be constrained by the industry’s dynamics. Finally, Cincinnati Financial’s balance sheet is in great shape and supports the company’s strong Dividend Safety Score. During the lean years, the company’s conservative balance sheet allowed it to continue paying and growing its dividend by using cash on hand and issuing debt and equity, if necessary. The company’s debt to capital ratio is a conservative 10%, and Cincinnati Financial also has strong credit ratings with S&P and Fitch. This is important given the unpredictable nature of catastrophe events in the insurance industry. Cincinnati Financial’s Dividend Growth Score of 66 suggests that the company’s dividend has close to average growth potential. Cincinnati Financial has raised its dividend for 56 straight years and has grown its dividend by around 3% to 5% annually during the last decade, even despite a number of challenges. Cincinnati Financial was hit with over $400 million in catastrophe losses in 2011, for example. Still, Cincinnati Financial managed to turn a profit in 2011 despite experiencing the two worst catastrophes in company history, and it went on to raise its dividend by 1.2% in August 2012. Going forward, Cincinnati Financial’s dividend growth will probably match earnings growth to keep the company’s payout ratio stable, which likely means investors can expect annual dividend growth in the low to mid-single-digit range. Despite trailing the S&P 500 by roughly 10% year-to-date, CINF trades at 25.5x forward earnings and has a dividend yield of 2.6%, which is below its five-year average dividend yield of 3.3%. Based on the stock’s multiples relative to history, it’s hard to make a compelling case for its valuation today. A 10% pullback to $68 per share would make CINF look more interesting for long-term investors. From a total return perspective, Cincinnati Financial can probably continue growing its revenue by at a low to mid-single-digit annual rate as it adds more agencies, sells new lines of insurance products (e.g. tailored policies for high network individuals; reinsurance), and continues it geographic expansion. With a reasonable amount of operating leverage and potentially some help from higher interest rates over the next 5-10 years, earnings per share could compound at a slightly faster pace, resulting in total return potential of 7.6% to 9.6% per year (2.6% dividend yield plus 5% to 7% annual earnings growth). Conservative income investors must be very careful if they decide to purchase shares of almost any insurance business. Larger, diversified insurance providers with long track records of managing risk conservatively are often the best bets. That’s why Cincinnati Financial is a favorite pick for income investors. The company is a proven, well-managed insurance business that has been a sound bet for safe, growing dividend income for more than half a century. While the insurance industry will continue experiencing its fair share of performance cycles, Cincinnati Financial has proven to be a disciplined risk taker with both its underwriting and investment portfolio. Investors seeking more yield should review some of the best high dividend stocks here. This article was originally featured on Simply Safe Dividends.